You knew sooner or later I'd roll the pizza over, right? I realize that there are endless variations on how to top a pizza, and I've barely scratched the surface of crust variations, but my spouse wanted a Nic-o-boli from Nicola Pizza in Rehoboth, Delaware for his birthday. And we now live in Ohio. And yes, I could order a frozen partially baked dozen shipped if I had to, but heck, I make pizza every week, so I should try this, right? Then I tried a few other variations on the theme for good measure. 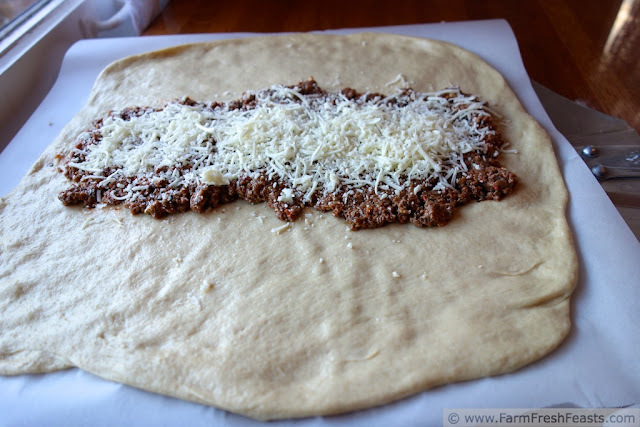 But those pizzas will be up later--for now, it's time to walk you through a basic rolled-over pizza, Farm Fresh Feasts style. You gotta crawl before you can walk, right? God bless physical therapists! They taught my son to walk--right after his baby sister was born. Oy! Bad timing! I consulted the awesome The Best Pizza is Made at Home by Donna Rathnell German for specifics on baking time/temperature, and tried to recall the flavors of the basic Nic-o-boli. Preheat oven to 400 degrees Fahrenheit. Mix meat and sauce together in the skillet you used to cook the meat. You want a thick, not watery, mixture so if your sauce is kinda runny cook it down over medium low heat until thickened. I used leftover breadstick dipping sauce plus some Fresh Tomato Pesto today. 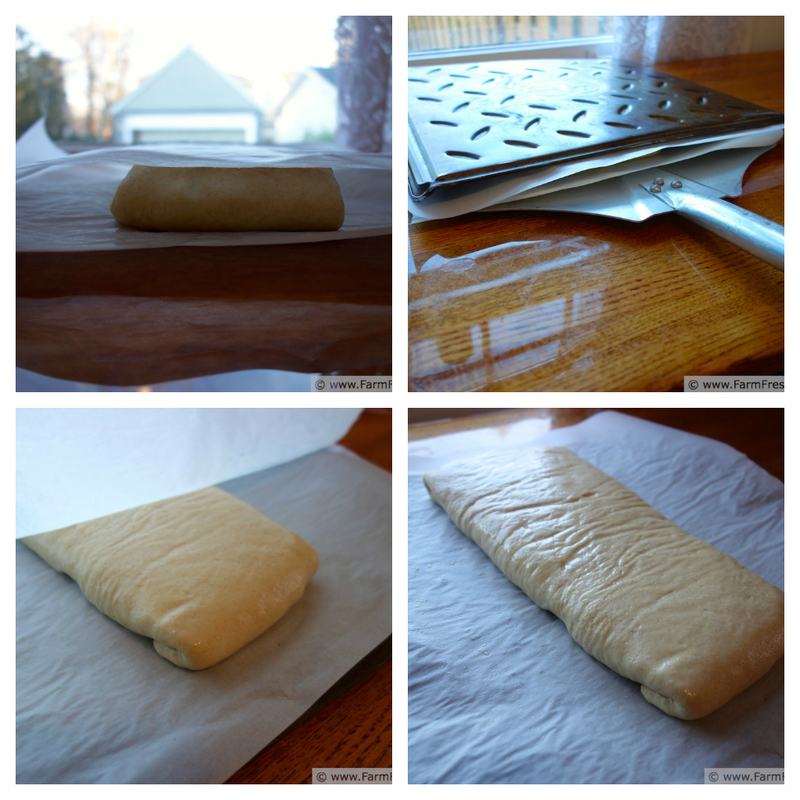 On an oiled piece of parchment, with <gasp!> a rolling pin, roll dough until a rectangular shape. 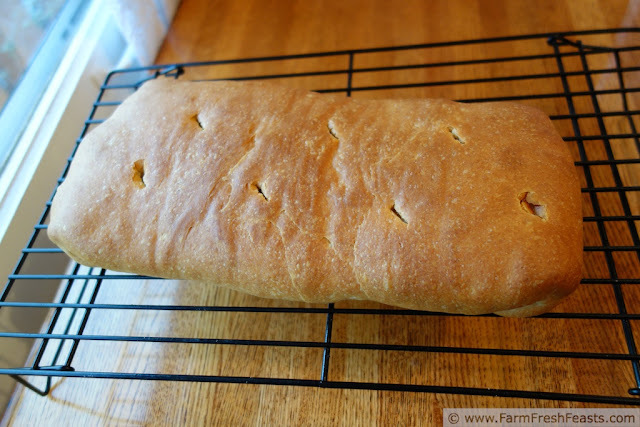 I'm not usually picky about dough shape, but your finished 'boli works better if you start with a rectangle. Visually divide the rectangle into 3 wide bands and spread the meat mixture over the middle third. Top with cheese. I'll pause to let you see what it looks like. Using the parchment paper, lift one end up and fold it over the filling. It will slowly disengage from the parchment--let it do its thing naturally. Grab the other side of parchment and fold the other end over. Pinch the ends. I'll wait while you check it out. Flip the whole thing over (if you don't have a pizza peel, use a second cookie sheet to flip) carefully. I used this ridiculously complicated method shown below, but do what you like. First, add a second sheet of oiled parchment on top. Then a cookie sheet, Then flip, lift off the new top sheet of oiled parchment and--drumroll, please--you've flipped your rolled pizza. Such gymnastics in the kitchen. Brush the new top with olive oil and stab it a few times to create vent holes. Bake for 25 minutes, shake it off the parchment, and finish another 5 to 10 minutes until the crust is browned. Cool on a wire rack, then slice and serve. Enjoy! This post is linked up with the What's In The Box at In Her Chucks, the Wednesday Fresh Foods Link Up at Gastronomical Sovereignty and What's Cookin' Wednesday at Buns In My Oven. I have to say my favorite rolled pizza of that kitchen gymnastics session was one I'll put up before Thanksgiving--turkey and pesto--it's such a fun way to eat pizza. Glad to inspire you like you've inspired me! Oooh, that looks delicious! Great job replicating a favorite recipe from across the country! That looks so enticing. 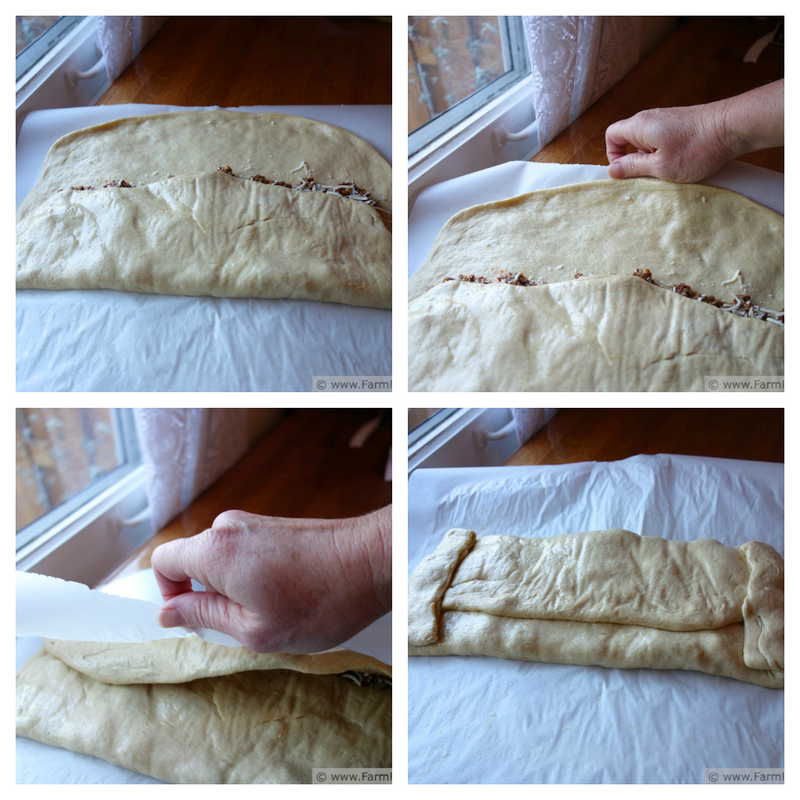 I like making a stromboli for the family every know and again, but I use store bought pizza dough. The great thing about store bought dough is that it is old enough to roll out easily. I love the Trader Joes herb flavored dough and need to figure out how they make that. When I forget (and I make pizza every week, how do I forget?) and am trying to shape a dough that was flour and water an hour before, it's a pain. 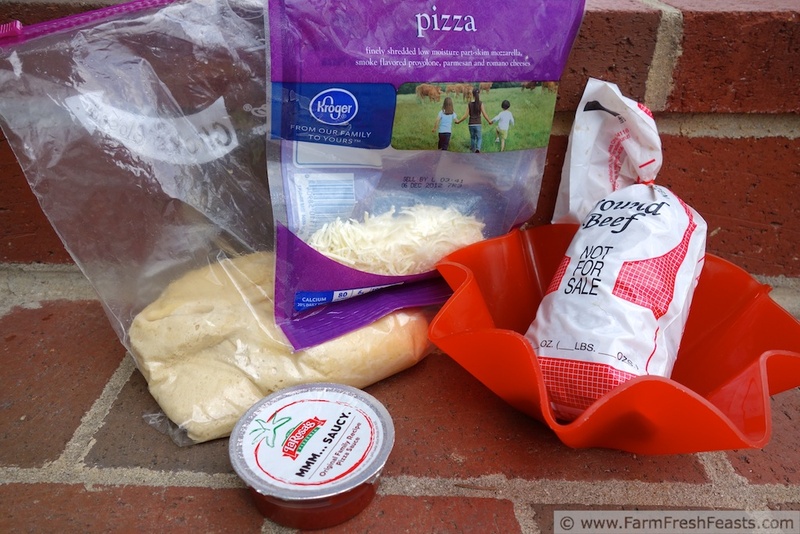 Pizza dough is ridiculously simple to make, so try it sometime. Just not right before you want to eat the pizza! We do pizza a lot - but I need to try this version. How fun! I'd love to have you come and link up at Taste and Tell Thursdays! I'd love to join you, and have marked my calendar to remind me. Kristen, that looks fantastic! My family would love it! My family sure loves their pizza nights. You are a genius! I love this idea, I see no reason why I can't stuff it with veggies. The step by step instructions are spot on, and gymnastics should always be done in the kitchen. Best spot for it, I always say. Have a great weekend. I look forward to seeing your stuffed-with-veggies, rolled and flipped pizza post! I've done 3 variations thus far, but all involved meat, so I'm curious what you do. I'm thinking artichoke, green olive, mushroom and pesto would be good--with feta and mozzarella. Now I am hungry. Now I'm hungry too! I bought two balls of pizza dough this weekend (they are local and only a 1.99 a pop) in your honor so I can do this very thing. I can't wait, and I love the idea of artichokes. In fact, I just love artichokes. I wish I could eat them in everything. The Hubby isn't a fan though (Boo Hiss). Looks fab. 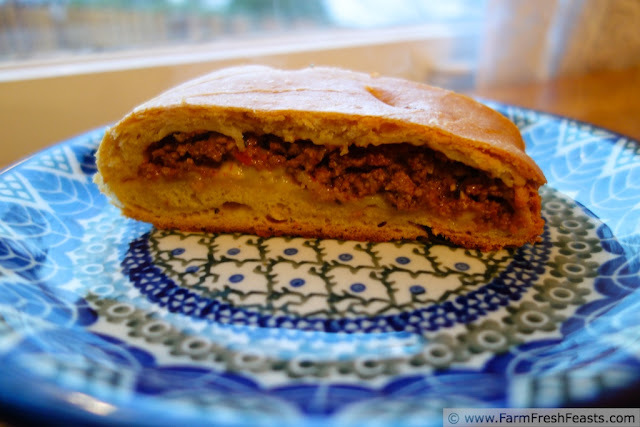 Lamb with a little ground cinnamon is another option. I think lamb with cinnamon would be delicious. I never think of lamb first (probably because there's half a cow in my freezer) but I should resolve to add lamb into my life in 2013. Yum! Would have to make this one just for me – the rest of the family doesn't like ground beef unless it is a hamburger or meatloaf. But we are all about each of us making pizzas that we like, so that would work just fine! I'd be hurting if my family wouldn't eat the cow in the freezer in any form other than hamburgers or meatloaves, as there is a lot of ground beef in there. I usually make a plain cheese pizza for my daughter, meat for my son, and veggie for me. My spouse eats everything. I'm glad your family makes pizzas that work for each of you! I'm going to keep my eyes peeled at the market for alternate ground meats--I love the suggestions. Thanks! What a good idea! We make pizza often, but this would be a fun different spin on it! Thanks for sharing! I agree, a different spin is good to do to keep things exciting in the pizza world. Kitchen gymnastics one week, weird dough colors another week . . . it's all good.